There are two options to be the sole Online Display Ad sponsor for a category for a month. Buy Now - Each category has the option to buy it immediately for up to 6 months. The fixed rate for each category is calculated based on estimated number of page views that are expected for that category using most recent results. The fee for this type of advertising includes ad design and one round of revisions per month. Any incremental changes to an ad will be billed additional creative fees. These slots are paid for at time of commitment on a first come, first served basis. An advertiser can buy more than one slot provided they are available at time of payment. All creative for these slots must be received by the 26th of the month to run in the following month. These slots are non-refundable as they can't be resold once displayed as sold to other potential buyers. Bidding - Based on the number of page views and the winning bid for each category from the previous bidding period, the potential advertiser can submit a binding bid for the following month. These bids DO NOT include any assistance with ad design. In the event an advertiser does not have in house graphics abilities, Uncle Henry's does offer ad creation services for an additional fee. Once the bidding period has closed (on the 20th of each month), no more bids will be accepted. The winner for each category is the highest bidder (unless the category was purchased outright using Buy It Now). In the event of a tie, the category will go to the first of the two equal bids received. The winner will be notified via email that they have won the category(s) and will then have until the 26th to complete payment and deliver their ad. If both payment and creative are not received in time, the slot will be awarded to the next highest bidder. If there is no winner for the category, then that category will revert to open and become part of the keyword / open category pool. These winners are determined separately as described below. Since keyword searches can cross multiple categories, they are not included in the Sponsored Category bidding. Keyword searches are lumped with any unsold categories to form one large pool of search result pages. 20 slots are allocated to this pool and all search results pages that are generated will be divided evenly between the 20 slots (or less if not all slots are sold). They are sold at a fixed rate on a first come, first served basis. An advertiser can buy more than one slot provided they are available at time of payment. The fee for this type of advertising includes ad design and one round of revisions per month. Any incremental changes to an ad will be billed additional creative fees. These slots are paid for at time of commitment. All creative for these slots must be received by the 26th of the month to run in the following month. These slots are non-refundable after bidding has closed as they can't then be resold. All ad creative must meet the below criteria, not compete with our core business, be consistent with the nature of our site, and be submitted on a timely basis as outlined above. Each slot sold will only have one ad for the month (ie, ads don't change during the run time). If an advertiser wants to run more than one ad, they would have to purchase more than one slot. Ads are uploaded by the advertiser from the Dashboard. In the event an advertiser does not have in house graphics abilities, Uncle Henry's does offer ad creation services (additional fee applies if purchased using bid process). For Ad Creation Services: Information including text, photos, url etc for ad should be emailed to advertising@unclehenrys.com. Uncle Henry’s will email the completed ad back for advertiser to approve and complete the upload process. For each category of ads that are displayed in the Reader App, the first ad shown will be the sponsor’s ad. For App users who choose to see images, they will see the full Online Display Ad. For those users who choose not to see images, they will be presented with the Sponsored Category Text (entered when uploading ad image after purchase). If no text is entered when uploading the ad image for the category, no ad will be displayed. The Sponsored Category Text will be shown on the appropriate category for users viewing the Ad Stream at www.unclehenrys.com/ad_stream and for users viewing the category on the Android "Ad Stream" App. It will appear after every 10th ad on the stream. 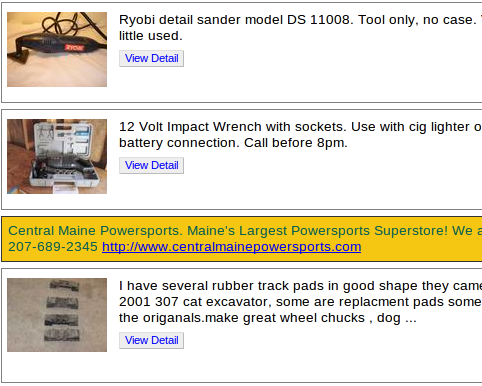 The Sponsored Category Text will be shown online in search results in the appropriate category as a Premium Line Ad. These are the ads that appear in search results as every eighth ad and are typically highlighted in yellow. They can include a link to your business web site as well. On average, a Premium Line Ad is displayed well over a hundred thousand times a month on our site. They are also shown to users of our mobile app. As a special offer to our online advertisers, you have the opportunity to purchase discounted print ad space if interested. 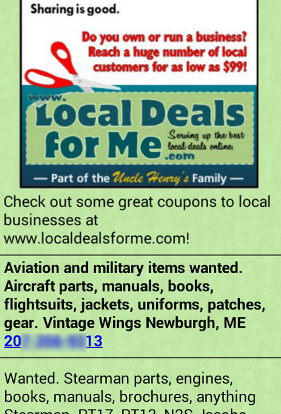 Uncle Henry’s will take the same ad you are using for your online display (category or open pool) and turn it into a 1/4 page print ad. This ad will then run one time during the month(s) your online display ad is running. The specific week is chosen by Uncle Henry's. This special discount offer is only available at the checkout when paying for your regular Online Display Ads. Advertiser must submit all bids in good faith with full intention of paying and running the ad(s) if slots are awarded. Failure to act in good faith may result in additional requirements for the advertiser up to and including exclusion from future bidding. 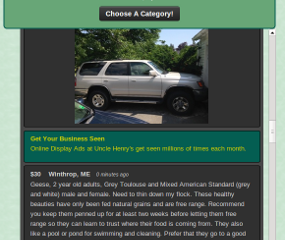 Uncle Henry's is providing the opportunity for an advertiser to place their advertisement in front of viewers of ads at www.unclehenrys.com. We do so with no guarantees of any kind. Results may vary and are based upon the nature of the viewers, the ad itself and a variety of other factors beyond our control. By providing an ad and paying for the slot, the advertiser agrees to bear sole responsibility for the success or failure of this advertising. No refunds or other liability of any kind is accepted by Uncle Henry's. Winning a slot does not guarantee any fixed number of views, click throughs or any other metric.